Japan doesn’t make new technology, they simply improve on what’s already out there. 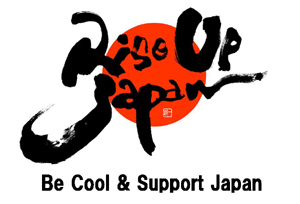 That’s what people say when talking about cool Japanese products like stereos, washing machines and even mechanical writing instruments. Take for example the Pentel Slicci Gel Ink pen, offered in dozens of hues and variable ball-widths. They come in fun, brilliant colors like ‘milk blue,’ and glide onto the paper like wet paint on linoleum. The smallest ball-point is .25 mm which is so thin and sleek it even makes bad penmanship look like a work of art. 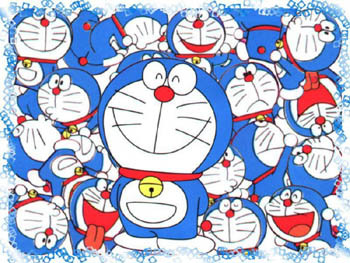 I use them to draw Doraemon. In Japan, whether you’re a guy or girl, old or young, you own a set of color pens. Unlike those boring Paper Mates, these Pentels are like trophies behind a glass case. And when you run out of ink, you’ll be sure to run out for a replacement. Oh wow, thinking about these pens triggered a flashback. When one of my last boyfriends broke up with me, I gathered my things and headed to the door. Though just before I left, I opened his desk drawer and grabbed a set of color pens he had borrowed from me. He might’ve stolen my heart, but I wasn’t going to let him steal my pens! 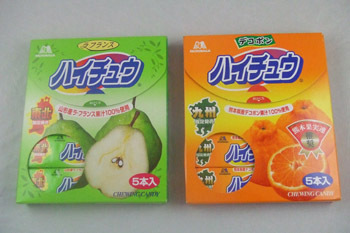 Morinaga, a major brand in Japan, produces different flavors of soft Hi-Chew candy — kinda like Starburst fruit chews — for different areas of the country, based on what type of fruit grows there. Each location has something special to offer that you can’t find anywhere else, just like with the Hello Kitty charms that Himawari loves. If you live in Tohoku (which means “northeast”), for example, you get to enjoy pear-flavored Hi-Chew, because Yamagata Prefecture in that region produces a large amount of Japan’s La France pears. If you live in Kyushu (the southernmost of Japan’s four main islands), the same type of candy comes in limited-edition Dekopon flavor. Dekopons are large, seedless, sweet oranges with a funny shape: a large bump on top. Because you can’t enjoy either of these treats unless you travel to Tohoku or Kyushu, they make excellent souvenirs. Visitors collect them and take them home for bragging rights. Besides, who needs real fruit? Actual La France pears are expensive these days: $5-6 dollars each. Pear Hi-Chew lasts longer, provides more bang for your buck, and tastes delicious. Tohoku also carries zunda flavor Kit-Kats from Nestle. At first, these threw me for a loop. 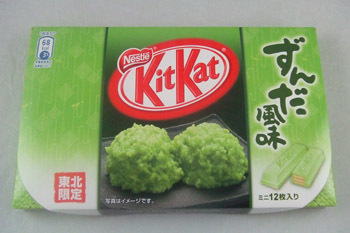 I was scared that the picture on the box was wasabi (maybe I need better glasses), but it’s really sweetened, mashed edamame beans. They’re creamy, almost like white chocolate! I highly recommend these Kit Kats, if for no other reason than to say you’ve tried them, but you might have to become penpals with someone from Tohoku in order to get some. Buying a house is at the top of my wish list for 2009, so I’m addicted to real estate sites like Realtor.com and Red Fin (why it’s called that I have no clue). 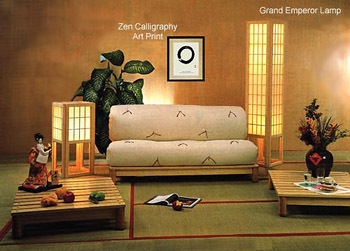 Depending on whom you ask, it’s either the best or worst time to buy – but if I should be lucky enough to find a place, I’d like to decorate at least one room in Japanese style. It shouldn’t be too difficult to do, because Japanese-influenced furniture can be found everywhere from Ikea to slightly higher-end stores like Modernica in Los Angeles and Muji in Soho. Each of these companies have taken the minimalist, uncluttered look common to Japanese homes and added their own touches. One of my favorite online stores to browse is Haiku Designs, which showcases solid blocks of color, soft lighting and low-standing couches, beds and chairs in a clean, simple layout. Don’t have much space to work with? 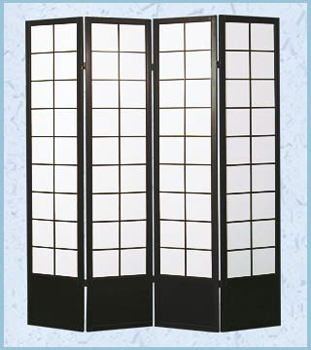 Adding a folding shoji screen, made of rice paper and wood, transforms one room into several, and they’re so lightweight you can change them up whenever you feel like it. The soft glow of a rice paper lamp adds a touch of warmth and charm to pretty much any surrounding. What’s for lunch? McDonalds? Leftover pasta? In a perfect world we’d all have amazingly cute lunches packed by mom. It’d have rice balls, juicy sausages, tiny boiled eggs, a pocketful of potato salad, an orange wedge… and every day we’d sit at a park bench nibbling on every morsel with a Thermos of green tea. Realistically, it’s way easier just to throw last night’s meatloaf into a Tupperware and bring it to work. But being the Japanophile I am, I substitute Mister Tupper for a fancy bento-bako (lunch box) if just to pass off the illusion that my lunch is better than yours. At Tokyu Hands you’ll find an entire section dedicated to these plastic boxes, some with their own tote and chopsticks, others shaped like a Hello Kitty. Bento-bakos are one step cooler now, literally. 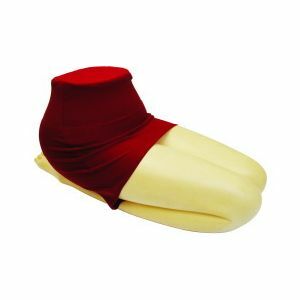 Some of them carry a cold-pack to keep your fruit salad crisp and perky. And then there’s the insulated boxes: Stuff it with rice, microwave, and voila! your meal is pipping hot 6 hours later. There’s also fancy lacquered boxes that come in stacks, that way you can separate your rice from the meat and vegetables. If you want to really impress your man, give him one of those and watch him devour each box as pink hearts flutter from his chest. Any of these boxes will set you back $25-$30, so it’s a wonder why people would buy them when a Ziploc could easily do the trick. But if you ask me, a cute bento box is the way to go. 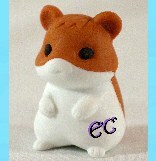 It’s eco-friendly, it helps curb portions, and it’s so damn cute it even makes brussel sprouts taste good. So what are you waiting for? Buy your own box and be the envy of all your friends! 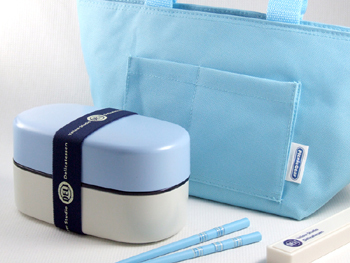 Cute, fancy stationary and stationary accessories are very popular in Japan. Lots of kids collect erasers shaped like food or cartoon animals, and adults are also on the lookout for the latest variations on home and office gear, like see-through fountain pens that show you exactly how much ink you have left. Pencil cases and watercolor sets make great gifts as well. Jet Pens has a series of colorful, mini-ball point pens that clip like clothespins onto your notebook. I’m always shoving my pens into the spiral and getting them stuck there, so this is probably number one on my to-buy list. I also like the correction-tape pens that come in different sizes, including one for your keychain. It’s like a hipper version of white out, perfect for quick fixes. 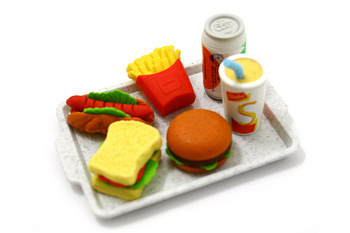 The cutest items by far are the novelty erasers, which seriously look good enough to eat. To my slight embarrassment, the “American food” category consists of donuts, cakes, shakes, French fries and burgers. 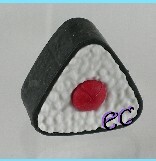 You may feel healthier using tiny erasers shaped like sushi, tempura, gyoza, onigiri rice triangles, dim sum, and even bowls of noodles!